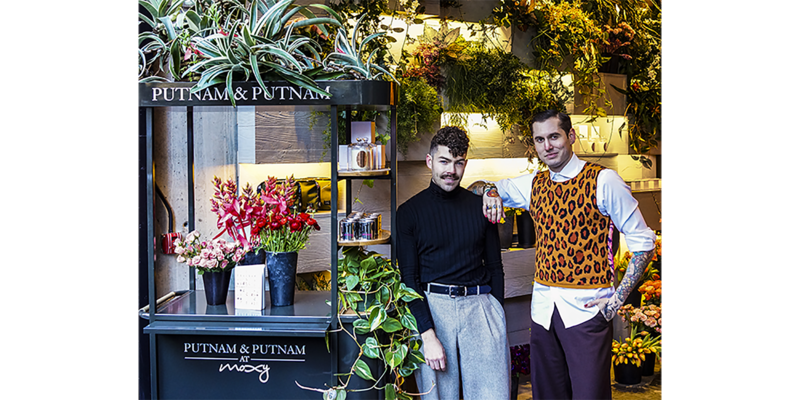 NEW YORK, NY, 2019-Feb-12 — /Travel PR News/ — Today (02/11/2019), Moxy NYC Chelsea announces an exclusive collaboration with New York City’s favorite florist duo, Michael and Darroch Putnam of Putnam & Putnam. Opening February 14th, just in time to buy flowers on Valentine’s Day, Moxy Chelsea will be home to Putnam & Putnam’s first retail location, where the famed floral couple has transformed the hotel’s entryway into an overgrown botanical experience, selling a curated selection of seasonal, fresh-cut flowers in addition to unexpected curiosities and whimsical gift items. This news release contains “forward-looking statements” within the meaning of federal securities laws, including the number of properties the company may add in future years and similar statements concerning possible future events or expectations that are not historical facts. We caution you that these statements are not guarantees of future performance and are subject to a number of risks and uncertainties, including changes in market conditions; changes in global and regional economies; supply and demand changes for hotel rooms; competitive conditions in the lodging industry; relationships with clients and property owners; the availability of capital to finance growth and refurbishment; and other risk factors that we identify in our most recent annual report on Form 10-K or quarterly report on Form 10-Q. Any of these factors could cause actual results to differ materially from the expectations we express or imply here. We make these statements as of the date of this press release, and we assume no obligation to publicly update or revise any forward-looking statement, whether as a result of new information, future events or otherwise. This entry was posted in Business, Hotels, Luxury, Resorts, Travel, Travel Management, Travel Marketing, Travel Services and tagged Chelsea, Darroch Putnam, flowers, Marriott International, Michael Putnam, Moxy, NYC, Putnam & Putnam, retail, Valentine’s Day. Bookmark the permalink.